This excellent police procedural is the twelfth mystery by Pauline Rowson. 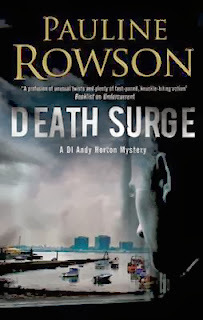 It opens with Detective Inspector Andy Horton enjoying time alone, on a free Saturday, on his yacht off of the Isle of Wight. He is considering the latest developments in his search for what happened to his late mother who disappeared in 1978 and his own efforts to try to trace what may have happened to her, when his thoughts are interrupted by a call on his mobile phone. It is Sergeant Cantelli, a close colleague whom he cannot ignore, who is really upset. It seems that Johnnie Oslow, his twenty-three-year-old nephew, has been missing since Wednesday. It appears that Johnnie had been involved in criminality seven years before and Horton had helped him redeem himself introducing him to sailing via a charity that rehabilitated wayward boys and girls. Johnnie had grabbed the opportunity with both hands and gone on to get a job as a crew member on a Greek millionaire's personal yacht and also as a team member on one of the same millionaire's many racing yachts. He was supposed to be involved in Cowes Week racing on another yacht but had disappeared before he got to his destination. His mobile phone was not responding. Horton appreciated the distress Sergeant Cantelli was feeling and said he would return to Cowes and begin looking into it. On the way he telephoned a couple of his men who said they would help look for the young man. So the investigation starts by Horton checking all known associates of the missing young man. He decides to question the young tearaways that he was involved with seven years before when he got into trouble and committed arson. They all individually say that they haven't seen Johnnie for years but the case carries on and a couple of weeks pass. More and more leads are checked until Horton is called to a crime scene and it turns out to be the dead body of one of the young former associates of Johnnie who has been brutally strangled. The story carries on in a very tightly plotted and sometimes very moving way until the very unpredictable and amazing ending. The author is very skilful in her steering of the plot and the red herrings that she suggests, that indicate various possible outcomes, when later in the story alternative options are outlined that shoot down these original thoughts. I must admit that I had no idea who the killer was until the end and it was a big surprise. This is a very gifted author and I have had the pleasure in reviewing two of her previous stories BLOOD ON THE SAND and FOOTSTEPS ON THE SHORE and knew of the high standard of her work and had no hesitation when I saw that this book was available for review. Pauline Rowson emphasises the marine aspect in her novels and the quality of her very descriptive writing is superb. with her hero Andy Horton living on a boat and is always going back and forward over the Solent. There is the sailing around Cowes which is a novel aspect to an otherwise modern police procedural. I was gripped until the last page of this very well structured and plotted story. Recommended.